Wotan - Table Type Horizontal Boring Mill | 5"
Very Nice Complete HBM. Runs Very Well! 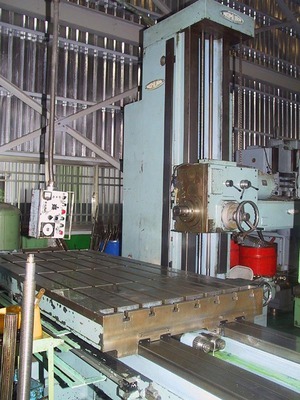 4.3" KURAKI MODEL: KBT-1105 DX HORIZONTAL BORING MILL. NEW 1985 with FANUC 6MB CNC, X=78" , Y= 59", Z= 57"
78" X 59.1" X 57.1" Horizontal Boring Mill with a Tosnuc 999 Control, 38 Position Automatic Tool Changer, 3000 RPM Cat 50 Spindle with Full 4th Axis.